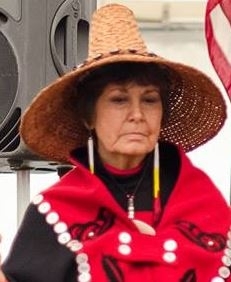 The Cowlitz people are a southwestern Coast Salish Native American people located in the state of Washington belonging to the Cowlitz Indian Tribe. Their name "Cowlitz" means “The People Who Seek Their Medicine Spirit”, which is also the name of the river along which were their traditional villages were located. They are headquartered near Longview, in Cowlitz county, Washington. Moreover, their reservation is located on 152 acres of land west of Interstate 5 near La Center, in Clark County, Washington. They are divided into four historical divisions: (1) Upper Cowlitz located in the north-eastern part of Cowlitz territory call themselves Teitnapum, (2) Lower Cowlitz located in the central and southern part call themselves "Stlpulimuhkl" (pronounced Sht-poo-lum), (3) Lewis River Cowlitz located in the east, and (4) Mountain Cowlitz located in the west. English is commonly spoken by the Cowlitz. However, the Cowlitz language is still spoken among the people. The Cowlitz language belongs to the Tsamosan branch of Salish languages. The majority of Cowlitz are non-religious or adhere to traditional indigenous practices. Some Cowlitz, due to their speaking English, adhere to evangelical Christian churches that use English for worship. Others adhere to Roman Catholicism. Pray that Cowlitz will recognize their responsibility to share the message of Christ and plant churches among unreached Native American people groups. Pray that Cowlitz will avoid being Christian in name only, but live a missional life both in word and deed.